Australia is a big country with a diverse array of climatic conditions that can influence the proper running of your car. Allowing budget and time for proper maintenance with cars in Australia is a must. Doing this not only saves you money on upkeep, but it also contributes to a safe ride. Here are some of the key considerations for you to keep in mind when you’re servicing your car in Australia. Unnecessary congestion is projected to cost Australians an additional $20 billion by 2020. From Melbourne to Sydney, and Brisbane to Perth, Australians live in some of the most congested cities in the world. According to the Grattan Institute Study on Productive Cities, unnecessary congestion is projected to cost Australians an additional $20 billion by 2020. “In significant parts of Australia’s four biggest cities, shallow labour markets and increasingly congested transport systems are holding back productivity by making it harder to get the best match between the skills of a worker and the demands of a job,” wrote study authors Jane-Frances Kelly and Peter Mares. Not only that, but commuting is taking its toll, too. The average commutes in the city and surrounds are getting longer and longer, which is a key reason why minimising traffic-related wear on your car’s engine is extremely important if you want to maintain the health of your vehicle. There are a couple of key reasons why traffic congestion can be costly for your vehicle. First, traffic congestion leads to higher fuel consumption. It also increases carbon dioxide emissions. This means additional cost to running your car as well as an increased risk to emissions violations. For a mainly urban-based driver, running a small car with a 4-cylinder engine reduces petrol and maintenance costs. Even if you’re a regional driver, you should consider the issue of fuel mileage when you’re purchasing a car. Choosing the right car for your driving lifestyle will help you cover the overall running costs of your car. It will also help you to keep regular servicing costs as low as possible. Whether a dry or tropical heat, Australian summers can be gruelling on all things vehicle related. It’s the warmer months when we travel the longer distances for holidays and it’s not unusual for families to drive for eight or even 12 hours on family holidays and road trips. A 40-degree day could mean a 60-degree day under the bonnet. That’s why smart Australian car owners make radiator care a priority. A thorough check of your radiator hoses and the overall health of your radiator should be a part of any regular service. This is definitely something you should consider undertaking as part of your pre-travel holiday checklist. Also, always monitor the amount of coolant in your radiator. Allow for a higher level of evaporation on hot days and longer trips. And always carry coolant in your boot for the unexpected top up, just in case you find you need it. The choice to install a bullbar on your vehicle is not one to take lightly. While we have some of the most beloved wildlife in the world, such as wombats, kangaroos, wallabies and koalas, their existence on the open road can spell disaster for even the most seasoned driver. 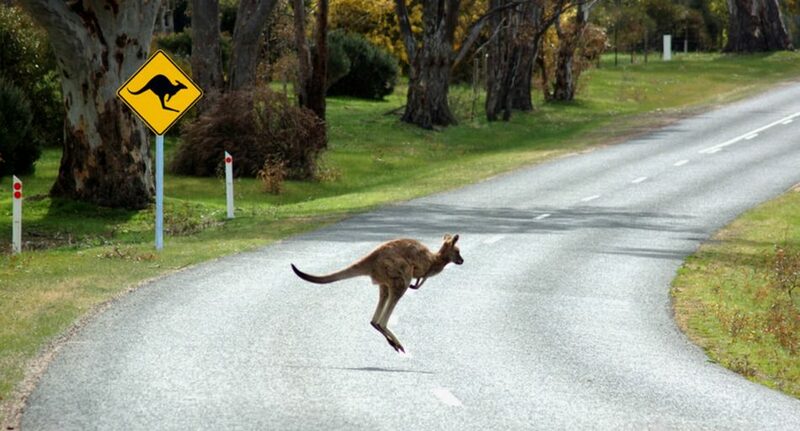 Kangaroos in particular can cause significant damage if they impact with your car. In fact, nearly 75 percent of animal-related car accidents involve marsupials. Stray livestock also poses a serious problem in many rural and outback areas. That’s why some Australians living in rural areas make use of nudge bars — also known as bullbars. Bullbars protect the front of your vehicle from hard, unexpected impacts with animals that can stop a car in its tracks. A bullbar may increase the risk of death or serious injury in the event of a pedestrian collision. As they are designed to cope with muscle-bound, large kangaroos, a car with a bullbar travelling at 30km can actually seriously injure or kill a child. For this reason, the choice to install a bullbar on your vehicle is not one to take lightly. Most of Australia uses a car at some point to travel from A to B. Here are some more articles about driving on our roads. To reduce the damage to pedestrians, the bars need to meet Australian design standards. They also require review and approval from the relevant state motor vehicle licensing body. Bullbars should be used sparingly to reduce the risk of pedestrian collisions. Shock absorbers and suspension play an important role in ensuring your car remains running smoothly. Australia is a large country with varied road conditions. Ask anyone who drives long distances for work or who has family scattered to the four winds. Driving in Australia is tough. Our tyres need to cope with the changing road conditions and high heat. Engine coolant is a necessity. Roads are not always well lit. Fog, mist, thick dust and heavy rain are all the kinds of things that make spotlights incredibly useful. Beyond this, Australian roads are inconsistent in quality. Therefore, shock absorbers and suspension play an important role in ensuring your car remains running smoothly. Not only do shock absorbers and suspension mean a smoother, more comfortable ride, your car’s handling can deteriorate over time. A car with poor suspension will pull to the side, drift and have trouble stopping. Left long enough, poor suspension creates balding and uneven wear in your tyres. All of which increases the risk of car accident. To maintain healthy suspension, attend to any change in ride quality, tyre condition and the car’s handling as soon as possible. It will (and should) take regular servicing to keep even the hardiest of vehicles on our roads in prime condition. Australia is a country of extreme conditions, of variable, wild terrains and serious weather environments. It will (and should) take regular servicing to keep even the hardiest of vehicles on our roads in prime condition. Try to stay safe, and lower your stress levels when driving by having comprehensive car insurance with a trusted insurer. Get a quote with Budget Direct and find the best solution for you. If you take the time to choose the right car for your particular lifestyle, and if you make servicing a priority, you can help to minimise some of the impact this wonderful but rugged country can have on your car’s lifespan and running costs.